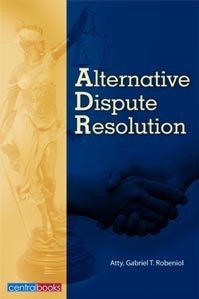 Publish on demand pioneer and FILCOLS member Central Books published the work of lawyer Gabriel T. Robeniol “Alternative Dispute Resolution” recently. Alternative means to resolve issues between and among parties is a better choice to costly and time consuming litigation. Aside from the big number of pending cases in courts, there is also a dearth in the number of support personnel and judges. The Intellectual Property Office of the Philippines (IPOPHL) pioneered ADR in Southeast Asia in relation to IP disputes. IPOPHL is one of the government agencies responsible for the establishment of FILCOLS. The other government agency is the National Book Development Board. Author Robeniol teaches at the University of Santo Tomas Faculty of Civil Law. Vice president for finance Jose Paolo M. Sibal sits at the FILCOLS board as Central Books representative. Book cover from the Central Books website.